WIN--------->MOON: cities go dark for one hour. Sydney's iconic Opera House and Harbour Bridge went dark Saturday night as the world's first major city turned down its lights for this year's Earth Hour, a global campaign to raise awareness of climate change. 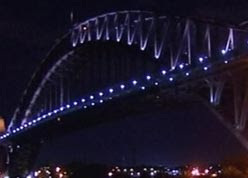 The lights on the Harbour Bridge were turned off at 8 PM, followed shortly by the Opera House and other city landmarks. Most businesses and homes were already dark as Sydney residents embraced their second annual Earth Hour. More than 2 million people and 2,000 businesses marked last year's event and organizers expected this year to be more widespread in Australia. The event was also spreading later in the day to hundreds of cities and towns in more than 35 nations, organizers said.